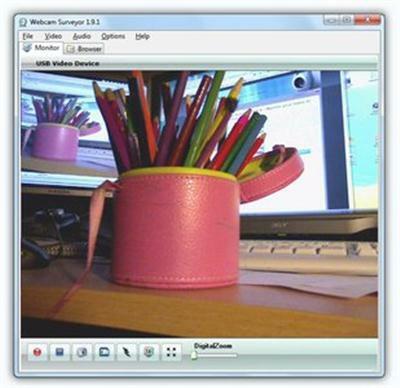 Webcam Surveyor is Webcam software that combines video surveillance and video capture tools. With this program you can easily record videos, take shots or record sequences of images. Work as a motion detector, software alerts to be trigged by events: send a email alert, upload images to FTP site, capture all motion activity in AVI video format. This makes it possible for you to observe remotely whatever activity your camera captures. The built-in file browser helps to organize the resulting images and videos. Webcam Surveyor is supported video and audio codec's like: MJpeg, DivX, Mpeg-4 and MPEG Layer 3 (MP3), WMAudio Encoder (WMA). Also with Webcam Surveyor you can capture sequence of images with an interval of time of a second to 59 hours. Video Capture - You can easily make a video from your webcam, just click on the "Start video capture" button. Webcam Surveyor supports the most popular video and audio encoding algorithms it allows a high quality and long time video recording. Capture to multiple video files - Using this feature you can make a continuous 24/7 video recording. Webcam Surveyor will be creating video files during video capture. You can adjust through a period of time the program will create the files. This allows you to view already captured files while record it continues. Capture Image Sequences - This feature allows you to take shots from a web cam at fixed intervals. Using this software you can create your own fast motion video or record the time stretched events. HD video recording - Webcam Surveyor is ready to use with high definition video sources. Up to 3 megapixel video stream supported. Motion Detection - Use your camera to monitor your office and home. It allows configuring various actions of the program, if motion is detected. You can adjust motion sensitivity and exclude the image area where the motions will not be detected. Motion Capture - This feature allows capturing only those frames in which it was motion detected. Using it you no longer need to watch a huge amount of unnecessary video. As well as at video capture, you can make a continuous 24/7 motion recording. Stealth Mode - You can hide Webcam Surveyor on your computer. Use this feature for hidden video surveillance. It allows to record video at the presence of undesirable people or to find out what happens with your PC in your absence. In stealth mode can use hot keys to manage it. Scheduler - You can set the schedule for the Video Recording, Image Sequence, Motion Detection, Email and FTP alerts. EMail Alert - Send a email message with snapshots if motion detected. Built-in File Browser with all shell extension - easily organizing captured images and video clips. Auto Start - Webcam Surveyor is ready to run when ShiChuang starts.